I mentioned in my last post that I would have a new challenge coming up, using Miyuki long magatama beads from The Beadsmith... and have completed a third of the challenge! Lisa Peters Art provided focal components for the designers chosen to participate, and The Beadsmith sent each of us several colors of the long magatamas to work with; Lisa did an amazing job matching colors with her beautiful handmade focals. I have to admit this has been a hard one for me, so far. Long magatama beads seem very bold and in your face looking to me, and the focal pieces are also large... and I am used to small little beads. I find the way that the bead itself is configured to be puzzling to work with, because the hole is drilled at a slant, and there is a definite front and back to each bead. I fiddled and futzed, I ripped apart, I tried three or four bead weaving stitches... and came back to embroidery. I immediately had fallen head over heels in love with Lisa's flower button component, and had to start with that. But I had no ideas on how to combine the magatamas with the focal! In the end, I decided that they looked like flower petals, and so went with that for my cuff. Although I made sure to use the magatamas on their flattest side for the embroidery, I did find that I had to add a little dab of glue to the tips to keep them flat against the surface of the embroidery. The cuff itself was a challenge, as well, in that I didn't measure correctly when laying out the outlines, and so it wasn't going to fit over a cuff blank... and figuring out how to get the clasp to stay where I wanted it, and look good, and be secure all at once... this was a learning project for sure!! I also used crosshatching in the background, which is a first for me. 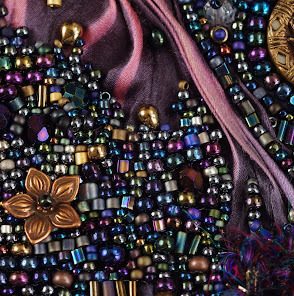 The details on the cuff are mostly layers - the bottom layer of embroidery, and then crystals and beaded 'leaves' are made and attached over that. 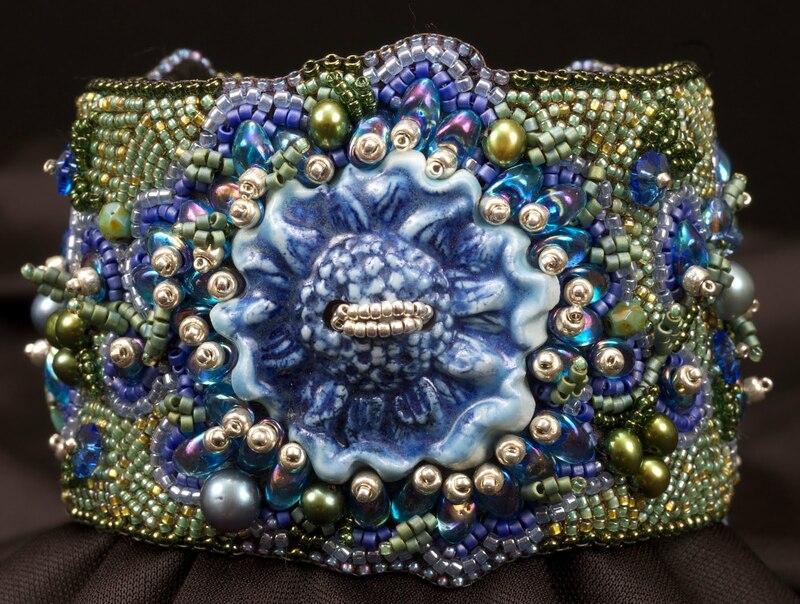 Make sure to stop by the gallery of work that Steven has provided on the Beadsmith Page here!! The clasp was gifted to me by my wonderful friend Linda Jones - and of course the focal and the magatamas came with the challenge. So, I want to pass the goodness on, and I will be giving this cuff away. Details on the cuff; it took me around five days to make. It had Swarovski flower crystals, fire polish crystals, seed beads, and freshwater pearls in it, and the clasp is 925 silver, with a hook and loop. It's backed with ultra suede and entirely sewn and embroidered with fire line, so it WON'T come apart. It measures 1.75" wide and exactly 8" long - it will fit snugly on those with a wider wrist size, and more like a bangle on those with a more slender wrist, as it stays rounded when worn. The clasp is amazing - and it won't come undone on you on accident, that hook is quite long. Thanks so much for following along with me, for sharing my links, and for taking the time to keep me company! 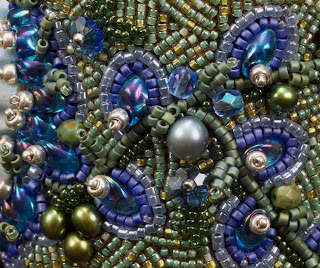 Now, on to the next Lisa Peters focal and the next shade of long magatamas - shiny gunmetal/silver... :) Happy beading! Oh you are soooo sweet and generous! I shared in Creative Bead Chat on FB too! I never would have thought to use the LMA's in a bead embroidery surface. Great design! Holy Moly Nancy! So blown away at your generosity! I'll go share this one everywhere I can! Ok, shared on Google Public, my timeline, and Bead Soup Cafe on FB. This is just gorgeous, as usual, and I LOVE the clasp. 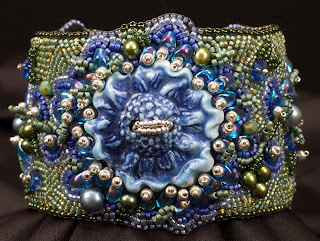 Absolutely amazing that you are giving away this gorgeous cuff! I sould so love to win this. I'm sharing on twitter and facebook. Praying for lots of sales to come your way! Oh, Nancy, you've done it again. This is so gorgeous. And it doesn't look like something you had to tear out and start over with. It looks designed and completed by real pro -- as you are. It's just beautiful. P.S. I think it was just about a year ago when one of your pooches was sick & had horrible vet bills. That's when I met you! I have some advice: Don't make this an annual event. It's not good for the stress level! HA! I love that bracelet. I posted both the blog and the tutorial on my facebook page. i love it! this bracelet is perfect--great beads, fantastic color and prefect styling!! What a beautiful cuff! i haven't tried the lng Magatamas, but I have seen some interesting patterns using them. They look like a challenge! Sending you some Fairy Dust! I'm not a seed-beader, I'm just in awe of those who are. What a magnificent piece! I was going to ask your permission to share it on my blog, then read further and found you were inviting that! I posted your giveaway and your shop on my FB page. Posting links everywhere I can! Keeping my fingers, toes, and eyes crossed that I win! Your cuff is amazing and I never would have thought of using long magatamas in BE they just seem too bulky lol!! 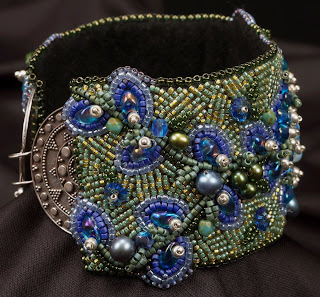 Ohhh what a gorgeous cuff and what a pleasure it would be to win it! oh, very beautiful... I love it! Thank you for this marvelous giveaway! and am now off to have a look at your shop! Thank you also for hosting this giveaway. Such a totally gorgeous and springy colorway. Love the combination, and the use of the magatamas is delightful as well! Bravo as usual Nancy! This is sooooo gorgeous. I'm just speechless. I've posted on my facebookpage www.facebook.com/esferajewelry and twittered it (esferajewelry). Check out my blog post about your giveaway if you'd like. 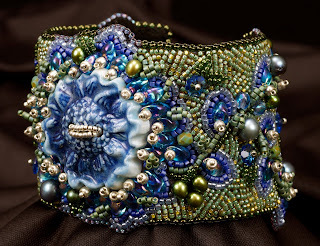 I greatly appreciate the opportunity to win this beautiful cuff. Shared on my fb page as well. Nancy - It's gorgeous!!! I pinned it on my "Beady Goodness" board on Pinterest. Just beautiful Nancy! I LOVE it so much! I'm in love! Your cuff is gorgeous and in an amazing colorway. I blogged (http://loismoon.blogspot.com/2012/04/win-awesome-cuff-from-nedbeads.html), but managed to get tutorial and giveaway in one post. One of my dogs is recovering from a brain infection - had him to a neurologist and he had every test known to man...so I feel you financial pain! I could have gone on a great vacation with the $ spent, but it was totally worth it to have my sweet pup back from the dead! Absolutely beautiful cuff. Fantastic job using the long magatamas. Inspired! Thank you for the chance to win this lovely. Love how to used that unique clasp. I've been playing with magatamas this past year & love how they give dimension to pieces. This is AHHHMAYzin! I Facebooked this and your etsy below, Google +1 you publically and tweeted your giveaway and etsy. So beautiful, .. such beauty needs to be rewarded by the means to get your lovely pup healthy.